Here is the complete Massillon Orangeman baseball schedule. This is a 17-18 year old team that plays a 49-game schedule plus a couple of tournaments. It's comprised of many players off of Massillon's 21-8 district championship team. Front Row: Coach Steve Kertes, Hank Austin, Andrew Marks, Dan Melito, Jason Savage, Vince Campisi, Vack Milburn, Nick Abbott(Absent). Back Row: Coach Rick Ullum, Drew Feucht, Joe Nadzam, Josh Strubel, Ryan Ridgely, Jason Abbott, Matt Duplain, BJ Budd, Chris Franks, Mike Groff, Coach Lee Abbott, Scorekeeper John Melito. Here are the summer offensive baseball stats with the players shown in the order of their batting average. Here are the summer pitching stats with the players shown in the order of ERA. Campisi .1 1 0 0 0 1 0-0 0 0.00. The Massillon Orangeman baseball team will play a 49-game schedule this summer plus a couple of tournaments as they prepare for next year's high school slate. The games come on the heels of a very successful 2000 season where the Tigers were 21-8 and won the district championship. The Orangeman team will compete in three different leagues this summer: Big Ten, CVBA, and GABF, playing many games in the Cleveland area. Included in that is 13 doubleheaders plus a couple of tournaments which means they will be playing a game almost every night throughout June and July. For local interest, the Orangeman Tournament will be held on June 22 thru 25 and June 29 thru July 1. Also, the Orangemen will host Vermilion on a July 4 doubleheader coinciding with Massillon's Picnic in the Park. Start time is 1:00. The Massillon Orangeman 17-18 year old baseball team is well into their summer season and currently sports an 8-7 record. Rick Ullum, a coach with the Orangemen, was kind enough to provide some stats of the games played to date. Watch for his reports as the season progresses. Game 1: Score: 5-0. Dan Melito has two singles and Joe Nazdam had a single and 2 RBIs. Mike Groff pitched a 4-hitter. Game 2: Score 6-11. Joe Nazdam had a single and 2 RBIs. Chris Franks had two singles. Game 1: Score 4-3. Matt Duplain had two singles, Dan Melito had a single and two RBIs, and Draw Feucht had a double. Jason Abbott picked up the win with Joe Nazdam recording the save. Note: BB Rooner's pitcher was Huntley who was the starting pitcher for Warren Howland in their district tournament game against the Tigers this past spring. Game 2: Score 6-9. Matt Duplain and Jason Savage each had two singles and Drew Feucht had a single and a double. Game 1: Score 3-6. Matt Duplain had a single and double plus 2 RBIs. Note: the Stark County team is composed of mostly graduated seniors from five of the top Division 1 programs in the county. Former Tiger stars playing for Stark County include Anthony Battle, Charles Hendricks, Chad Marceric, and Todd Helline. Game 1: 4-2. Jason Savage had a single and double. Jason Abbott was the winning pitcher and Josh Strubel picked up the save. Game 1: 15-5. Matt Duplain had two singles and a double, B.J. Budd had two singles, Vince Campisi had a single and two RBIs, and Chris Franks had three singles and two RBIs. The winning pitcher was Jason Abbott. Note: The Orangemen played the next eight games with only nine players as several were attending the football camp in Kentucky. Game 2: 6-22. Jason Savage had two singles, and triple and one RBI, Joe Nazdam had two singles and one RBI, Dan Melito had a single and two doubles, and Drew Feucht had two singles and two RBIs. Game 2: 5-3. Jason Savage had a single and a double, Dan Melito had a single and two RBIs, Ryan Ridgley had a double, and Josh Strubel had two singles and one RBI. Jason Savage picked up the win. Game 1: 10-0. Andrew Marks had two triples and one RBI, Dan Melito had a single, a double and one RBI, B.J. Budd had a single and a double, Mike Groff had three singles, and Drew Feucht had two RBIs. Game 2: 12-1. Jason Savage had a single and a double, Joe Nazdam had two singles, a double and three RBIs, Ryan Ridgley had a single, a triple and two RBIs, and Chris Franks had a single and two RBIs. The winning pitcher was Andrew Marks. Game 1: 10-4. Andrew Marks had a single, a double and two RBIs, and B.J. Budd had a double. Mike Groff was the winning pitcher. Joe Nazdam struck out four batters in 1-2/3 innings of relief. Note: GlenOak started Weller who pitched against the Tigers in the sectional tournament last spring. The Massillon Orangemen ran their record to 9-7 with a convincing 15-5 win over the visiting Stow Red Sox. The contest lasted only six innings due to the 10-run rule and was highlighted by a barrage of Massillon runs that put this one away much earlier than the sixth. Jason Savage started on the mound and struggled with his control, giving up three runs in the second. In spite of the early Stow lead, Manager Steve Kertes was not concerned. Savage had "one bad inning," said the coach. "The second inning was kind of wild for him. He settled down pretty good I thought. Our offense is not going to skunked very often. We'll hit the ball and put the ball in play." The coach was right on the button as Massillon scored in each of the next five innings with a combination of solid hitting, walks and Stow errors. By the end of the fourth and the Orangemen holding an 11-4 lead, this one was as good as over. "It's easy to coach that kind of game, mused Kertes. "There's no pressure on me; I can't screw up." Batting wise Matt Duplain had a double and one RBI, Jason Savage had two singles and one RBI, Jason Abbott had a single, and Chris Franks had a double. Budd relieved Savage late in the game simply to get in some work. Coach Kertes boasted of three number one pitchers on this team in Jason Savage, B.J. Budd and Mike Groff. Savage and Budd pitched for the Tiger varsity last year while Groff lead the JV team. Massillon's record is now 9-7. "In one league we play a lot of all-star teams from different parts of the state. We're out of our league, caliber wise. But that's what we're here for, to get better. We're 6-3 in GABF and I think we're doing fine," concluded the coach. Caption: (1) Dan Melito scores the winning run, (2) winning pitcher Jason Savage, (3) B.J. Budd lays down the bunt, (4) Jason Abbott fouls one off, (5) Melito takes away the double, (6) Savage scores for Massillon, (7) Ryan Ridgley takes the big lead, and (8) Hank Austin takes the big cut. The Massillon Orangeman baseball team is now 10-8 after splitting their last two outings. On Tuesday they lost on the road to the Ohio Eagles 5-2 and then rebounded to best Medina Highland 13-0 on Wednesday at home. The game against the Ohio Eagles was a Greater Akron Baseball Federation contest played at Marlington High School. Ohio Eagles is a multi-school team that includes a number of players from St. Thomas Aquinas' 2000 district qualifier. For the Orangemen, Andrew Marks had a double and Chris Franks had a double and two RBIs. Against Medina Highland the Orangemen were without three starters who were participating in the summer basketball program. But they still managed to smoke Highland 13-0 in Cuyahoga Valley Baseball Association action. Starting pitcher Chris Franks tossed a 4-hitter, striking out nine batters in the process. Five different players had a pair of hits each. Vince Campisi had two singles and one RBI, Dan Melito had two singles and two RBIs, Jason Abbott had two doubles and four RBIs, Hank Austin had two singles, and Drew Feucht had two singles and one RBI. Next up the Orangeman Tournament which will be played at Ducky Schroeder field this weekend. On Friday the locals entertain GlenOak. Assistant Coach Rick Ullum contributed to this story. The Massillon Orangeman baseball team captured two of their last three games in improve their record to 12-9. The wins came in the four-team Orangeman/Dumonts Classic against GlenOak and North Royalton/Brunswick. Unfortunately, Sunday's schedule was rained out. On Friday, the Orangemen lost a home game against Medina Highland, 4-1. A 3-hit, 10-strikeout effort by Josh Strubel was wasted as the Orangemen sleepwalked through a game against a team they mercy-ruled at the opponent's field the night before. Jason Abbot had two singles and one RBI, Jason Savage had a double and Ryan Ridgley had a pair of singles. The good news is that the Orangemen are back at full strength with the players returning from summer basketball. Four teams participated in the 3-day event including Massillon, GlenOak, Strongsville, and North Royalton/Brunswick. A full slate of games was played on Friday and Saturday, but the remainder of the Classic cancelled due to the rain that moved in on Sunday. The Orangemen captured their opener with an 8-2 win over GlenOak. It seems that beating GlenOak in baseball is becoming habit-forming. GlenOak rekindles the Orangeman's interest. As is the case in summer baseball, it sometimes takes a traditional rival to bring out the best in the kids during a long and grueling schedule. Jason Savage was the winning pitcher, going 5-1/3 innings and giving up only three hits. Jason Abbott came in to finish the game and struck out two while allowing only a single hit. Both pitchers were praised by Head Coach Steve Kertes for their efforts. Matt Duplain had a single, a sacrifice fly and two RBIs, Andrew Marks had a home run and two RBIs, Jason Savage had a triple, Jason Abbott had two singles, a double and one RBI, and Drew Feucht had two singles and two RBIs. In the second game, the Orangemen completely dismantled North Royalton/Brunswick 11-4. Jason Savage came up big in this one with two singles, a double, a home run, and two RBIs. Joining him in the hit parade were Hank Austin and Chris Franks each with a double, Andrew Marks with a double and two RBIs, Jason Abbott with a single, a double and two RBIs, and B.J. Budd with a single and a double. The winning pitcher was Joe Nazdam. Coach Steve Kertes summed up the weekend this way: "Our first game was Friday against GlenOak. Jason Savage pitched a great game. We held them to two runs, scored eight. We beat their second best pitcher. We face their first best a week ago, Jim Waller, and we beat him too. That will help our kids out next year since we face GlenOak during the season. "Yesterday we beat a team combined of North Royalton and Brunswick, a good hitting team. Joe Nadzum pitched a great game, relieved by Andrew Marks. We hit the ball well. We drove the ball to the fence. Jason Savage had a home run. So it's probably the best game we played all year. All around pitching, defense and hitting. "The kids are playing well. The pitchers are coming along, throwing more strikes than balls, finally. Our offense is coming along really good." The Orangemen will play a 6:15 pm home game on Monday against the Ohio Eagles and then travel to Stow on Tuesday and Olmsted Falls on Wednesday. Next weekend the Orangemen host another tournament, this one a round-robin event involving the Stark County Knights (St. Thomas Aquinas players), Medina Highland, Vermillion American Legion, Kent Eagles, and Canal Fulton Northwest. Massillon will open play on Thursday against Northwest and play again on Friday against Kent. Both games are at 4:30. On Saturday they play two games, Medina Highland at 2:00 and Vermillion at 4:30. The tournament concludes on Sunday with the Orangemen going against the Stark County Knights at 2:00. In the event that two teams are tied for the lead after all games have been played, a championship match will be held at 4:30 on Sunday. Assistant Coach Rick Ullum contributed to this article. The Ohio Eagles scored in the late innings to beat the Massillon Orangemen 8-3. The Orangemen were in this one, down just 4-3 after five innings but it slipped away in the sixth. A seventh inning lead off triple by Joe Nazdum went for naught as he failed to ignite a late rally. Chris Franks started on the mound and pitched nearly five innings, departing with his team trailing by just a single run. Mike Groff finished the inning unscathed but ran into trouble in the sixth as the Eagles plated three runs to essentially put the game out of reach. Josh Strubel pitched the seventh. "I don't know what happened, said Head Coach Steve Kertes. "I watched it and I still don't know what happened. We threw the ball around; we walked a couple guys; they got a couple hits. The next thing I know it's 8-3. You're down by one, you can play for one run. You can bunt him over, a hit ties it up. But down by five, that changes the whole game. "They hit the ball pretty well, obviously. They got 15 hits against us. Chris Franks pitched pretty well in 5-2/3 innings. That's two good outings in a row he's had. He's been pitching great for us. If he keeps it up we'll be fine." "He (Mike Groff) hasn't pitched for a while. He hasn't pitched since last Tuesday since we got rained out on Sunday. When you're off for six days, it takes a toll on you. He's going to start Wednesday against Olmsted Falls, so he'll be fine. I have all the faith in the world in Mike." On Tuesday the Orangemen, now with a record of 12-10, will travel to Stow for a 6:15 pm GABF contest. The Orangeman won two away games in preparation for this weekends Orangeman/Dumont Classic. By identical 11-7 scores the Orangeman beat Stow Reds (GABF) and Olmsted Falls (CVBA). See story for details and tournament schedule. LH-Chris Franks 1B,2B/3RBIs, Drew Feucht 2 1Bs/RBI, Mike Groff 2 2Bs/RBI. In a rain delayed opener for the Orangeman they beat GABF rival the Ohio Eagles 17-8 at Schroeder Field Friday afternoon. The tournament resumes at 9:00AM today with the Orangeman scheduled to play CVBA opponent Medina Highland at 4:30PM. See tournament schedule for complete results. LH- Andrew Marks 3B/2RBIs, Matt Duplain 3 1Bs/RBI, Joe Nazdam 2B/2RBIs, Dan Melito 3 1Bs, 2B/4RBIs, BJ Budd 1B,2B/2RBIs, Ryan Ridgely 2 1Bs/2RBIs, Chris Franks 2 1Bs/RBI. The Orangeman remained unbeaten in the Orangeman/Dumont Classic after mercy ruling Medina Highland (CVBA) 12-2. They finish the tournament Sunday with games against Vermilion (9AM) and the Stark Knights (4:30PM). All games are at Schroeder Field. After spotting Medina Highland a 2-0 first inning lead the Orangeman came roaring back with 3 in the 1st, 2 each in the 3rd and 4th, 4 in the 4th and 1 in the 5th to end the game. This was due to the 10 run mercy rule and ended the game 20 minutes short of the normal time limit (2:15) set for tournament games. The key hit was a 2-run single by BJ Budd in the bottom of first to give the Orangeman a 3-2 lead they would not relinquish. Chris Franks earned the win by scattering 4 hits over the first 4 innings with Joe Nazdam pitching a scoreless final inning. Manager Steve Kertes was again pleased with ability of his team to put the ball in play and create an identity for itself as a consistent offensive force. The pitching has some veteran performers and the only question was when and not if the hitting would come around. It appears this team is well on its way to disproving any doubters. LH -Andrew Marks 3B/RBI, Jason Abbott 1B,2 3Bs/2RBIs, Dan Melito 1B,2B/RBI, BJ Budd 1B, 2B/3 RBIs, Joe Nazdam 2B. The Orangeman continued their hot hitting winning the Orangeman/Dumont Classic in convincing fashion. After mercy ruling fellow Big Ten rival Vermilion 15-4 they won the final game clinching the championship with a 13- 5 victory over fellow GABF member the Stark Knights. After falling behind 2-1 going into the bottom of the 2nd the Orangeman exploded with 10 runs in the bottom of that inning. Aided by shaky Vermilion pitching and defense the big hit of the inning was a 2-run single by Joe Nazdam. They then scored twice in both the 3rd and 4th to end the game after holding Vermilion scoreless in the top of the 5th. The Orangeman fell behind 3-0 in the first inning but came back to tie the game on run scoring ground out by Dan Melito and run scoring singles by BJ Budd and Joe Nazdam in the bottom of the inning. The Orangeman took the lead with 2 in the 4th on a RBI single by Andrew Marks and run scoring ground out by Jason Savage. The Knights came right back to tie the game with 2 in the 5th with the Orangeman taking the lead for good with 5 in the 5th and 3 in the 6th . Key hits in the 5th inning were Joe Nazdam and Ryan Ridgely with RBI doubles and RBI singles by Jason Savage and Drew Feucht along with a sac fly by Andrew Marks. LH- Andrew Marks 2 1Bs/2RBIs, Matt Duplain 1B, 2B, BJ Budd 2 1Bs,2B/RBI, Joe Nazdam 2 1Bs,2B/3RBIs, Ryan Ridgley 2B/RBI. late and they tied it up 5-5. That was my fault. He throws a lot harder than that normally, but today he didn't have it. He battled for us, kept us in the game four innings. It was a good job by him." team. We probably averaged 13-14 runs per game in the tournament"
"We hit the ball well today. We've done that for about a week now. We're driving the ball, putting it in the gaps and down the line occasionally and hitting the runs in. With that, it's easy to win in baseball." Here are some photos of the tournament champions, the Massillon Orangeman. The Orangemen played outstanding ball throughout the tournament, plating over fifty runs in the four games. The next home game is on Tuesday at 10:00 am against Vermilion. Here are some more photos of the game against Stark County. These guys sure know how to relax when the pressure is off. Led by designated cheerleader Jason Savage, this is an awfully fun group to be around. The Massillon Orangeman 17-18 year-old baseball team are off to a 2-0 start in the Orangeman/Dumonts Classic held at Schroeder Field. The Orangeman, now 12-9, handed North Royalton an 11-4 setback Saturday afternoon. A six-run sixth inning helped the Orangeman blow the game wide open. Andrew Marks drilled a two-run double that keyed the frame. Entering that inning, the Orangeman only led 5-3. Jason Savage led the offensive charge, collecting four hits, including a two-run home run in the last of the first inning. He also tripled and singled twice. The Orangeman, which finished with 11 hits. Jason Abbott and B. J. Budd both singled and doubled. Abbott drove in two runs. Budd had one RBI. Hank Austin also had a run-scoring double. On Friday, the Orangeman opened the tournament with an 8-2 victory over GlenOak. Orangeman bunched its runs, scoring two in the third, four in the fourth and two in the fifth. Trailing 1-0 heading into the last of the third inning, the Orangeman took the lead. Matt Duplain singled in the tying run and Marks drove in the go-ahead run withaground out. Drew Feucht keyed the fourth inning outburst with a two-run single. Marks led off the fifth inning with a home run, padding the lead. The Orangeman, the only undefeated team left, have scheduled games against Strongsville at 2 p.m. and GlenOak at 4:30 p.m., both at Schroeder Field. Rick Quinlans pain often results in Tom Yinglings gain. Quinlan, the coach of the Jackson Post #419, knows the cards are stacked against his baseball team most of the time, but the long-term results often help the Polar Bear varsity squad. Playing with a young roster comprised exclusively of Jackson High students, Post #419 has recorded a 7-15 record so far. Many of their games are against teams that take players from several different schools according to Quinlan. That considered, Quinlan is happy with his teams efforts. "They are great kids," Quinlan said. "A lot of the kids in American Legion ball are 18 and 19. Ive got kids that are 16 to 17, but theyre coming together. That intimidation they felt earlier is gone." That strong competition might result in a fair number of losses for the team, but it toughens them up in the long run. "(Yingling) expects us to get our butts kicked," Quinlan said. "It toughens us up. I see theyre getting tougher." Things may be getting a little better for Post #419. After struggling early in the season, the club has won four of their last five games. Among the leading batters on the Jackson team are Nick Maragus, who saw some varsity action this year, Jason Quinlan and David Bules. All of whom are hitting in the .350-.375 range, Quinlan said. "(Bules) hurt his knee and was out for a year," Quinlan said. "He has really helped our team. Hes a tough kid." Also providing regular hitting this year have been Zach Moody and Matt Wilson. The team strength lies in its pitching Quinlan said. Another with experience with the varsity Polar Bears, Wes Steiner, is the clubs ace pitcher. Bules, Quinlan, Shawn Nottingham and Brad Cochran round out the staff. "(Nottingham) was clocked at 88 miles-per-hour in the gym," Quinlan said. "He can regularly throw in the mid-eighties and when he has his control, he is strong." When you post a 45-8 record, it is a difficult thing to repeat. Thats what the Orangeman baseball club is in the process of finding out. So far this year, the Orangeman has posted a 12-10 record with a group of hitters that is still trying to find its groove. Assistant coach Rick Ullum thinks they are beginning to find it with recent wins over North Royalton and Greater Akron Baseball League wins over Stowe and Medina Hilland. By playing in the GABL as well as the Cuyahoga Valley League, the Orangeman players have a schedule of nearly 55 games per year Ullum said. "We lost a number of starters, but when you play this many games you give everyone a chance to play," Ullum said. "We give the kids a good mixture of opponents. The hitting is starting to come around." That is a good thing as the Orangeman is going into its Orangeman/Dumonts Tournament this weekend at Schroeder Field. It will play at 4:30 p.m. Thursday and Friday against Northwest and the Ohio Eagles respectively. Saturday they will play Medina at 2 p.m. and Vermillion at 4:30. The Orangeman has a strong Massillon Tiger element to it with Jason Abbott, Jason Savage and Dan Melito among its leading hitters. Abbott leads the team with a .438 average. Savage is second with an average of .356. As well as carrying one of the Orangemans big sticks, Savage is one of the teams top hurlers. So far this season he carries a 3-0 record with a 3.04 earned run average. Andrew Mark carries a 2-0 record with a team best ERA of 1.26. Mike Groff is 3-1 with a 2.30 ERA. JAMES ZEMKO/The Inde Orangemans Dan Melito, left, handles the ball on a flip from Matt Duplain, right, for the force of Ohio Eagles Adam Benshoff during the Orangeman/Dumonts Classic Tournament at Ducky Schroeder Field Friday. 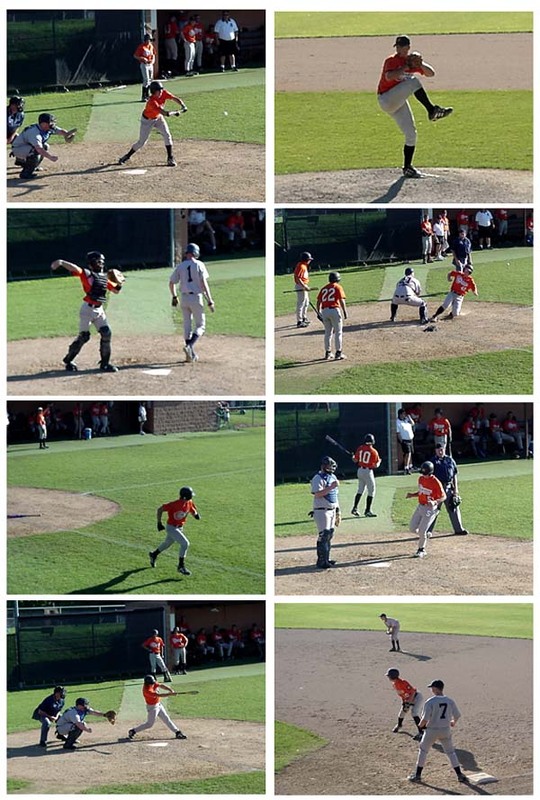 The Orangeman baseball club got off to a good start in its own tournament with a 17-8 pounding of the Ohio Eagles out of Kent in the first round of the Orangeman/Dumonts Classic Friday afternoon at Ducky Schroeder Field. A couple of huge innings in the second and fourth innings doomed the Eagles. The Orangeman tacked up six runs in the second inning to make the score 7-0, only to have the Eagles cut their lead to a 7-5 by the fourth inning. As if waking an angry giant, the Orangeman posted seven more runs in their half of the fourth inning and effectively putting the Eagles out of the game. While the Eagles coughed up five errors in the game along with walking six batters, the Orangeman earned most of their runs by slugging out 14 hits. "We put the ball in play a lot," Orangeman coach Steve Kertes said. "Offensively that is our best attribute. Were not going to drive the ball. They had trouble today throwing the ball around, and we took advantage." The Eagles had played a game that morning in which they beat Northwest 7-2. Eagles coach Mark Hairston said his team just slept through the second game of the day. "Its too bad you didnt see us play the first game," Hairston said. "We played baseball and this one we didnt. (The Orangeman) did what they had to do and we didnt." After two quick outs in the first inning against the Orangeman, the Eagles committed an error that would lead to the Orangemans first run of the game. Joe Nadzam hit a routine ground ball to the second baseman, who overthrew first base. After Dan Melito singled to move Nadzam to third base, the Orangeman pulled off a successful double steal that saw both runners safe and the score 1-0. Eagles pitcher Denny Highsmith escaped the first inning after giving up only one run, but he would not be so lucky in the second inning. Chris Franks and Drew Feucht led off with back-to-back singles. Andrew Marks moved them up a base with a sacrifice bunt. Matt Duplain walked to load the bases for Nadzam, who doubled off the left field fence to score Franks and Feucht. Melito would follow with another double to drive in Duplain and Nadzam. One strikeout later, Mike Groff slashed a ball past a diving third baseman that brought Melito around from second. Ryan Ridgely would finish things up with yet another double to plate Groff. Up 7-0, the Orangeman might have become a little complacent going into the visitors third inning. Either way the Eagles started a modest comeback bid with a big inning of their own. After recording the first out of the inning, Orangeman starter Andrew Marks gave up a six singles and a walk, paving the way for the Eagles four-run inning. The Eagles Matt Yoder singled and D.J. Gross walked. Clean-up hitter Brandon Hairston smoked a ball past the second baseman to score Yoder and move Gross to third. Hairston and Gross pulled off a double steal of their own to make it a 7-2 game. Adam Benshoff singled to left, bringing Hairston to third. Brandon Krowka connected on a half-swing that dropped the ball into shallow right field to plate Hairston and send Benshoff to second. Curtis Rhoads laid down a picture perfect bunt that hugged the third baseline to load the bases. Brian Hussel hit a hopper that bounced through the gap to score Benshoff and make the score 7-4. At this point, B.J. Budd came in to relieve Marks and forced a pair of ground balls to end the inning. The Eagles scored another run in the top of the fourth to make it a two-run game, but a long fourth inning would end that. The Orangeman would hit three hard shots off Eagles pitcher Jeff Pyles, who relieved Highsmith at the beginning of the third inning, but it would be walks and errors that would prolong the rally. As well as a triple off the bat of Marks, a double that got by the left fielder by Budd and a Melito single, three batters walked,two reached on errors, and a third reached on a passed ball. Duplain pitched the final two innings for the Orangeman giving up three runs on three hits. The Orangeman was in the midst of another big inning when the game was called in the sixth inning because of time constraints. They had added another three runs and had an out remaining. As well as losing to the Eagles Friday morning, Northwest also was on the short end of a 7-6 decision to the Stark Knight later in the day. Today, Northwest will take on Vermillion at 11:30. The Orangeman will play back to back games against Medina (at 2 p.m.) and Vermillion (at 4:30 p.m.). All games are at Ducky Schroeder Field. Northwests Steve Spradling tries to turn a double play with Vermillions Matt Kalester sliding into second base during the Orangeman/Dumonts Classic Saturday afternoon at Schroeder Field. Saturday afternoon at the Orangeman/Dumont Classic featured two teams going in opposite directions. Northwest remained winless in three tournament games with a 14-8 loss to Vermillion, while the host Orangeman baseball club won its second game of the tournament in a 12-2 cakewalk over Medina Hilland. Through the first five innings of its game against Vermillion, Northwest kept things close. Going into the Vermillion half of the sixth inning, the Indians were down 5-4. However during the sixth, the Indian pitchers lost their grip on their pitches and Northwest lost its grip on the game. "We had one bad inning," Northwest manager Steve Spradling said. "We had a pitcher hit three kids in a row and throw a wild pitch. Through the first five innings we played a good game. Justin Clark pitched excellently. We replaced him with Chuck Ellison and he had a bad outing." Clark started the sixth inning and promptly gave up a single to Steve Coughlin when he was taken out and replaced by Ellison. Struggling with his control from the first pitch, Ellison proceeded to plunk the next three batters in a row followed by a wild pitch. By the time Spradling relieved Ellison with Matt Fahrney in the sixth the score was 7-4. The first Vermillion batter to face Fahrney, Mike Fowler, knocked a single into left field to score two more runs. Mike Kallister would plate Fowler with a triple and score himself on a subsequent fly ball off the bat of Mike Dembak to make it a 11-4 spread. Northwest attempted to battle back in their half of the sixth inning scoring four runs thanks in part to singles by Eric Spradling, Aaron Lowery, Adam Winter, and a two-rundouble by Tom Noffsinger. Earlier in the game, Steve Spradling Jr. had helped keep his team close with a two-run first inning home run and a third inning triple that drove in two more. "Theyre 16 and 17 years old," the elder Spradling said. "Theyre all Northwest kids. Theyre all from Canal Fulton, just trying to make the Northwest baseball team a little better. We dont take any graduated kids." While the Indians were struggling to keep their pitches under control, Orangeman starter Chris Franks cruised to the decision against Medina Highland. After giving up a couple of runs in the first inning, Franks shut Medina down for the next three innings, before Joe Nadzam came on to finish the game out. Orangeman manager Steve Kertes said Franks had beat Highland 13-0 earlier in the season and gave him the nod. "Hes got an above average fast ball and he hits his spots on the outer third of the plate," Kertes said. "Thats what youve got to do as a pitcher. Thats the way you get those little pop ups and those weak ground balls. He did a good job for us." Not that Franks needed a whole lot of run support, but he got it in droves. The Orangeman tacked up runs in each of the games five innings, before it ran into the ten-run rule two-thirds of the way through the fifth inning. Up 2-0, Highland looked like it was on its way after recording a quick two outs in the Orangeman half of the first, but Highland would commit two costly errors to pave the way for an Orangeman comeback. The number-three batter, Jason Savage, began things with a single up the middle and quickly stole second. Clean-up hitter Jason Abbot hit a solid grounder that ate up the Highland second baseman. In the mean time, Savage scored from second base. A walk would put Abbott at second and Dan Melito at first when B.J. Budd hit a shot into left field. Instead of fielding the ball cleanly and holding Budd to a single, the left fielder fumbled the ball. Both Abbott and Melito came home and Budd ended up at second. After another pair of runs in the second and third, the Orangeman put the game on ice with a fourth inning hitting display that would plate four runs. When youre swinging a hot bat, not much is going to stand in your way. In the four-day Orangeman/Dumonts Classic, which was completed Sunday afternoon at Ducky Schroeder Field, the Orangeman were the team wielding the red-hot war clubs, and they came away with the tournament championship. "The kids have been hitting the ball real well lately and the pitching has been great," said Orangeman coach Steve Kertes after his team clinched the title with a come-from-behind 13-5 victory over the Stark County Knights. "We scored double figures all four games, which doesnt hurt any. Weve averaged 13-14 runs a game. When you do that, its easy to win." The Orangeman showed just how easy they could come up with runs in their final game of the tournament against the Knights, which is comprised of players off of the St. Thomas Aquinas roster. Things did not start out very well for the Orangeman, who found themselves in a 3-0 deficit before they could record the first out of the game. The first four Knights reached base thanks to a throwing error on the first hitter of the game followed by three base hits. However, Orangeman starter Jason Abbott settled down to record a pair of strikeouts sandwiched around a flyout to get out of the inning without any more damage. Andrew Marks led off the bottom of the first inning for the Orangeman with a solid single and went to third on a double by Matt Duplain. An infield pop-up for the first out forced both runners to stay put, but Dan Melitos slow grounder to first allowed Marks to score and Duplain to move to third with two outs. B.J. Budd came through with a single to right field to score Duplain, and then advanced to second when the Knights right-fielder overran the ball. Joe Nadzam followed with a single to score Budd with the tying run, but Nadzam was left on first when Knights starter Greg Jenoir recorded a strikeout for the third out of the inning. "Getting down by two or three runs isnt going to bother me at all," Kertes said. "Were going to put the ball in play a lot and score some runs. Well get a lot of doubles and hit-and-runs. We cant hit a lot of home runs, but we can score." Things remained quiet for both teams until the home half of the fourth. Drew Feucht drew a lead-off walk and stole second base, then moved to third on a groundout. Marks then stepped to the plate and rifled a single to score Feucht with the Orangemans fourth run of the game. Marks also stole second base and went to third when Duplains hot smash to third was not handled cleanly by the third baseman. Keeping with the aggressive nature of the Orangeman on the base paths, Duplain stole second before going to third on Jason Savages RBI groundout which plated Marks to make it 5-3 Orangeman. But the lead was short-lived as the Knights added a pair of runs to tie the game at 5-5. The Orangeman responded to the two-run fifth by the Knights by putting a five spot of their own up in the home half of the inning. Nadzam gave the Orangeman the lead for good with a run-scoring double to plate Budd, who had walked. Chris Franks moved Nadzam to third on a sacrifice bunt, and Feucht and Ridgley came through with back-to-back RBI hits - Ridgleys being of the two-base variety - to make it an 8-5 game. Ridgley scored on Marks sacrifice fly to right field. Duplain walked and came around to score on a Savage single to make it 10-5. The first three Orangeman hitters in the sixth inning all reached base and scored against Knights reliever Matt Kohler to put the game out of reach for all intents and purposes. In the first game of the day, the Orangeman posted a 15-4 five-inning victory over Vermilion. The key was a 10-run second inning in which eight different Orangeman players scored at least one run. Marks registered three hits, while Savage and Ridgley each had a pair of hits to pace the Orangeman offensive attack. The Orangeman let 2 games they led late slip away wasting fine pitching performances by Mike Groff and Chris Franks. The Orangeman lost to BB Rooners, split with Brecksville both in away games and beat Twinsburg at home. Next up is Medina, 7/9 for a doubleheader starting at 10AM. The Orangeman scored 5 in the 3rd inning but couldn't hold on, allowing 3 unearned runs in 6-5 loss to the GABF leader BB Rooners. Mixing timely hitting with Rooner miscues lead to the big inning with Jason Savage, Matt Duplain contributing RBI singles and Dan Melito plating a run on a ground out. Mike Groff pitched 6 innings allowing 3 earned runs and striking out 6. Chris Franks pitch no hit ball for 6 2/3 innings striking out 10 before allowing 3 straight hits that gave Brecksville the win and overshadowed an outstanding pitching performance. Unfortunately for the Orangeman after a Jason Abbott 2 run home run in the first the Orangeman were not able to generate any offense allowing Brecksville the chance to be in position to get back into the game. In the second game of the doubleheader the Orangeman jumped out to a 7-1 lead after 4 and hung on for the win. Big hits were an RBI double by Joe Nazdam and and an RBI singles by Ryan Ridgely and Drew Feucht in the 3rd, and a 2 run RBI double by Nazdam in the 4th. Andrew Marks pitched a complete game for the win. LH-Dan Melito 1B/RBI, BJ Budd 3 1Bs, Joe Nazdam 2 2B/3RBIs,Ryan Ridgely 2 1Bs. A 9 run 2nd inning allowed the Orangeman to cruise to victory over CVBA rival Twinsburg. Big hits in that inning were RBI singles by Jason Savage and Joe Nazdam and an RBI double by Drew Feucht. BJ Budd was lifted early due to the large lead and Joe Nazdam received the win in a game shorted by the mercy rule after 6 innings. LH-Matt Duplain 3 1Bs, Dan Melito 2 1Bs,2B/2 RBIs, Ryan Ridgely 2 1Bs, Drew Feucht 2B/2RBIs. B.J. Budd took control right from the get-go as the Orangemen opened a 9-0 lead after two innings and cruised to a 14-4 win over Twinsburg. With about two weeks remaining in the season, the Orangemen now sport a fine record of 20-12. The Orangeman head into the last week of the season attempting to gain one of two available bids in the CVBA to qualify for the state AABC tournament the third week of July in Struthers. A heavy schedule of CVBA teams is on tap this week with all games but Friday on the road. The Orangeman opened a 2-1 lead with 11 3rd inning runs to put the game out of reach in a 14-3 mercy rule win against 2nd place Newbury. Big hits in the 3rd were a 2-run opposite field HR by Jason Abbott, a RBI single by Jason Savage and 2-run singles by Dan Melito and Adam Weise. BJ Budd pitched 1 hit ball for 4 innings and received the win with Ryan Ridgely and Vince Campisi finishing the game. LH- Matt Duplain 2 1Bs, Jason Savage 1B,2B/RBI, Jason Abbott 1B,HR/2RBIs, Adam Weise 2 1Bs/2RBIs. Aided by 4 Twinsburg errors and numerous passed balls in the 4th,5th and 6th innings the Orangeman scored 10 runs to put a 2-0 lead beyond reach winning 13-6. Hits in those innings were in the 4th a single by Matt Dupalain, in the 5th and 6th singles by Dan Melito and singles in the 6th by Andrew Marks and Jason Savage. Andrew Marks pitched and received the win displaying outstanding control till tiring in the 5th. Jason Abbott closed the game retiring the side in order striking out two in the 7th. LH- Andrew Marks 2 1Bs/RBI, Matt Duplain 2 1Bs/RBI, Jason Savage 2 1Bs, Dan Melito 2 1Bs/RBI. The Orangeman showed an understandable lack of motivation against the last place team in the CVBA, a team they recently mercy ruled. Leading only 4-2 going into the 5th inning they scored 4 that inning and 6 in the 6th to again mercy rule Nordonia 14-4. Big hits in the 5th were an RBI single by Ryan Ridgely and a 2-run single by pitcher Chris Franks. In the 6th Matt Duplain and Jason Savage singled home runs and Dan Melito singled in 2 to end the game. Chris Franks pitched 2 hit ball and struckout 6 to get the win with relief help from Andrew Marks and BJ Budd. LH - Matt Dupalin 1B,2B/RBI, Jason Savage 3 1Bs/2RBIs, Dan Melito/3RBIs, BJ Budd 2B, Ryan Ridgely 2 1Bs, Chris Franks 1B,2B/3RBIs. The Orangeman traveled through a cloudburst to play in less than ideal conditions yet mercy ruled the number 3 team in the current CVBA standings 13-3. Going into the top of the 3rd tied 1-1 the Orangeman broke open the game with 8 runs. A Jason Savage 3-run HR and an 2-run 2B by pitcher Mike Groff along with Ryan RIdgelys' RBI single were key hits. Mike Groff went the distance striking out 8 and walking one. LH- Andrew Marks 3 1Bs/2 RBIs, Jason Savage 2B,HR/4 RBIs, Jason Abbott 2B, BJ Budd 3 1Bs, Mike Groff 2B/2 RBIs,Drew Feucht 2 1Bs/RBI. The Orangeman won a seesaw battle 14-10 with Medina in the opener of a doubleheader Sunday. After regaining the lead with 5 runs in the bottom of the 1st after falling behind by two in the top half of the inning the Orangeman battled Medina the entire game to gain the win. Going into the bottom of the 6th tied 10-10 the Orangeman struck for four runs to decide the issue. Keyed by an RBI single by Vince Campisi and a RBI double by Dan Melito the Orangeman also scored on steals of home by Drew Feucht and Andrew Marks on failed squeeze attempts. Keys hits in the first were a 2 run single by Dan Melito and RBI singles by BJ Budd and Joe Nadzam. Matt Duplain gained the win in relief with BJ Budd closing the door by striking out the side in the 7th. LH- Andrew Marks 2 1Bs/RBI, Jason Savage 2 1Bs/RBI, Jason Abbott 2B/RBI, Dan Melito 1B,2 2Bs/3RBIs. In the second game of the doubleheader the Orangeman mercy ruled Medina 12-1 behind the 1 hit pitching of Jason Abbott who also hit a 2 run home run to contribute to the offense. Holding only a 4-0 lead going into the top of the sixth the Orangeman put it out of reach with 8 runs keyed by Abbotts' 2 run home run and Hank Austins 3 run double. Dan Melitos' 2 run triple in the first put the Orangeman in front to stay. LH- Hank Austin 2B/3RBIs, Jason Abbott HR/2RBIs, Dan Melito 1B,3B/2 RBIs, Ryan Ridgely 2 1Bs, Drew Feucht 2 1Bs. The Orangeman wound up their regular season this weekend with CVBA games at Aurora and Strongsville. They have qualified for the State AABC Connie Mack tornament in Struthers and will play Springfield at 3PM Wednesday at Austintown Fitch High School. See story for results. Due to scheduling difficulties which required the intervention of CVBA officials the Orangeman only played one game this weekend. A decision was reached by league officials early Monday afternoon and the Orangeman received #1 bid to the State AABC Connie Mack tournament in Struthers. They will play Springfied on Wednesday at 3PM at Austintown Fitch High School. In the game at Aurora the Orangeman jumped out to an 8-3 lead after 2 innings and coasted to the victory. Big hits in those innings were in the first an RBI single by Jason Savage and an RBI groundout by Ryan Ridgely plus a two run single by Dan Melito. In the second Savage again singled a run in and BJ Budd drove in three with a double. Solo home runs were added in the third by Chris Franks and the 4th by Jason Abbott. Mike Groff received the win running his record to (6-2), best on the team with Josh Strubel coming on in the top of the 6th to finish the game. L.H.- Jason Savage 2 1Bs/2RBIs,Jason Abbott 1B,HR/RBI, BJ Budd 2B/3RBIs, Chris Franks HR/RBI, Drew Feucht 2B. The Orangemans' summer season ended Saturday afternoon with a 9-1 loss at Boardman H.S. The Orangeman finished the summer with a 29-14 record and a strong 2-2 showing at the AABC Connie Mack State Tournament. Down 2-0 going into the bottom of the third the Orangeman regained a lead they never reliquished on the strength of a 3-run home run by Dan Melito. Following Matt Dupalin reaching base on a fielding error and Jason Savages' single, Melito homered over the right center field fence. In the fourth Vince Campisi singled and moved to second on a throwing error on the play. Drew Feucht then executed a perfect sacrifice bunt which resulted not only in a single but put the infielders out of position trying to field the bunt. Campisi saw this as he rounded third and never stopped scoring on the play. After a walk to Melito and a Chris Franks single in the fifth, Ryan Ridgely moved them up on one of five successful Orangeman sacrifices on the day. Campisi then squeezed home Melito and Feucht singled home Franks to extend the lead to 6-2. The Orangeman scored the final two runs on a 2-run home run to right center by Melito in the sixth. BJ Budd pitched a complete game 4-hitter to record the win. LH- Jason Savage 2 1Bs, Dan Melito 1B,2 HRs/5RBIs, Chris Franks 3 1Bs, Drew Feucht 2 1Bs/2RBIs. A lack of offense and shaky defense allowed the Astro Falcon an early five run lead that put the game out of reach in a 11-0 Orangeman loss. Four Falcon hits aided by two Orangeman error lead to the big second inning. Mike Groff allowed five earned runs on seven hits over the first five innings shutting the Falcons down in three of the five innings he pitched. The Falcons had only two multiple hit innings the entire game but poor defense and a lack of offense was too much for the Orangeman to over come. Coaches Comment: Although the Orangeman played poorly the Youngstown Astro Falcons are what is wrong with this tournament. In a tournament called the "Ohio State Connie Mack Championship Tournament" they have only two Ohio players on their roster. While most stacked teams are composed of a number of high schools best players, the Falcons and several other teams in the tournament are composed primarily of college freshman. I only ask and makes no excuses "What advantage do they gain for their players baseball experience by playing "out of their league." The Northern Ohio team and others that were in the GABF along with us a few years ago have moved on. The wooden bat leagues and Class A leagues where former and current college player play would be more on their level of experience, why do they choose to play where the playing field is tipped so much in their favor? This is an fine tournament with great facilities and great teams, it on needs a few adjustments to be even better. The Orangeman rebounded in state AABC play with a 6-1 victory over Vermilion Post 397 at Cene Park Friday morning. The Orangeman opened the scoring with a run in the first when Jason Savage tripled home Matt Dupalin who had singled. In the second Joe Nadzam singled Ryan Ridgley doubled him to third and Nadzam scored when Drew Feuchts grounder was misplayed by the Vermilion third baseman. Jason Savage opened the third with a triple and scored on Dan Melitos' sac fly to right. Joe Nadzam walked Chris Franks reached on a fielders choice as BJ Budd who had singled earlier was forced at third Ryan Ridgley reached on a error by the shortstop loading the bases and Nadzam scored when Feuchts' grounder was misplayed by the pitcher. In the fourth Matt Duplain leadoff with a triple and scored on Jason groundout to the third baseman. Dan Melito doubled moved to third on BJ Budds' fly out to right and scored on Joe Nadzams' double to center to complete the scoring. Jason Abbott pitched a complete game and struckout 10 for the win to raise his record to 4-0 for the summer. LH- Matt Duplain 1B,3B, Jason Savage 2 3Bs/2RBIs Dan Melito 2B/RBI, BJ Budd 1B,2B, Ryan Ridgely 2B. The Orangeman ended their summer season with a 9-1 lost at Boardman H.S. The Orangeman managed only three hits with Drew Feucht doubling in BJ Budd for the only run and extra base of the game in the fourth inning. The Massillon Orangeman won two of their first three games and remain alive in the 38th annual Ohio State Connie Mack tournament (17-18 year olds) held in the Youngstown area. The Orangeman, 30-13 overall, moved into the consolation semifinals of the tournament following a 6-1 victory over Vermilion Friday at Cene Park in Struthers. Jason Abbott scattered six hits while striking out 10 in recording the victory. Abbott, a left hander, had impeccable control, throwing 98 pitches, 72 for strikes. The Orangeman, which scored at least one run in each of the first four innings took a 1-0 lead in the last of the first inning on a single by Matt Duplain and triple by Jason Savage. Savage had two triples, Duplain added a three-base hit, while B.J. Budd and Joe Nadzam each cracked a single and double. Ryan Ridgley and Dan Melito also doubled. That victory followed Thursday's 11-0 loss to the Youngstown Astro Falcons, a team comprised of incoming college freshmen and considered the tournament favorite. The Orangeman opened the tournament with an 8-2 victory over Springfield Armoloy at Austintown Fitch on Wednesday. Budd pitched a four-hit, complete-game victory, walking two and fanning four. Swinging the big bat for the winners was Dan Melito, who homered twice and drove in five runs. His three-run blast in the third erased a 2-0 Springfield lead. He added a two-run shot in the sixth capped the scoring. Chris Franks added three hits while Savage and Drew Feucht contributed a pair of hits to the offensive output. The Orangeman are scheduled to meet the Diamond Boys at 12:30 this afternoon at Boardman. 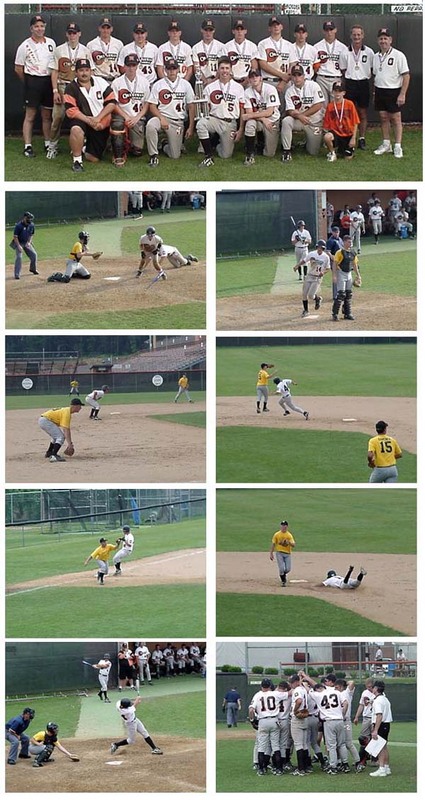 The Massillon Orangeman concluded its season with a 29-14 record, following a 9-1 loss to Cleveland Diamond Boys at Boardman in the 38th annual Ohio State Connie Mack tournament this past Saturday. The Orangeman, competing in the 32-team event for 17-18 year-olds, only mustered three hits in its second defeat of the tournament. Its first loss was 11-0 to Youngstown Astro Falcons last Thursday. Diamond Boys, the designated visiting team, took the lead with three runs in the first inning, added two more in the second and put the game away with a four-run fourth. The Orangeman scored its only run in the fourth inning, when Drew Feucht drove home B.J. Budd with a double. Budd, who was one of the team's top pitchers at 4-1 with a 1.26 ERA, had reached base on a walk. Ryan Ridgley and Jason Savage added singles. Ridgley's hit came in the second inning, while Savage reached base on his hit in the third inning. The Orangeman split its four tournament games. Jason Savage, who tripled twice in his team's 6-1 tournament victory over Vermilion last Friday, wound up the team's top hitter for the summer at .418. Dan Melito, who had a pair of home runs for the Orangeman in an 8-2 victory over Springfield Armoloy in its opener of the Connie Mack tournament last Wednesday, was second at .415. In addition to Budd, four other pitchers had productive summers for the Orangeman. Mike Groff went 6-3 for the Orangeman, Jason Abbott and Andrew Marks both won all four of their decisions and Jason Savage went 3-0. Budd, Abbott and Groff are all left handers. The Orangeman, which competed in three different summer leagues, qualified for the Connie Mack tournament by winning the Cuyahoga Valley Baseball Association, recording a 17-2 mark. A key to the success of the Massillon Varsity Baseball Program starts with summer baseball. The mix of varsity and JV players competing together as a team for the first time goes a long toward in determining what kind of season the varsity will have in the spring. See story for highlights. The summer season brought together a core of key starters from the varsities' regional semi-finalists along with a number of starters from the highly successful junior varsity team. As a result of a successful summer season and valuable experience gained by playing four games in the AABC State Connie Mack Tournament many questions have been answered about the upcoming varsity season. The Orangeman play in three leagues that differ in their makeup and focus. The Cuyahoga Valley Baseball League is a league with teams made up of players from their community much like the Orangeman. We have been dominant in that league over the last several years, although top teams such as Stow, Hudson, Brunswick and Solon have dropped out as more and more of their better players move on to the better "stacked" teams for a better quality of competition. We won that league this year with a 17-2 record which qualified us for the AABC State tournament. The Big Ten and GABF are more of your traditional summer leagues made up of teams that select their players from a number of schools. Player specialization is the focus, the player is picked to play one position and if he was a multi-position player on his high school team then his weaker position suffers as he only plays where he is the most skilled. One of the problems with these teams is that players are shuffled in and out depending on their performance or if a better player is available. If you don't perform you quickly end up on the bench and shortly thereafter you are dropped from the team if you performance doesn't improve. Also players who might play more than one position on their local team are often limited to one position on these teams, limiting their development. Both leagues have become somewhat weaker over the last few years with the better teams and players gravitating toward the Youngstown "B" league, a AAU league in Cleveland and one team (Northern Ohio)even is a member of the Great Lakes Summer Collegiate League that plays at GlenOak High School. The purpose of the lengthy summer season is to gain a significant amount of playing time for player development. That way a determination can be made objectively of which players will play together best as a team. The team has competed the past three years in the AABC Connie Mack State tournament, one of the top tournaments in the state. The benefit of playing in this tournament is invaluable for a number of reasons. By playing the best "stacked" teams in the state the varsity players get to compete in tournament baseball on a level above their own high school tournament. Playing at Cene Park gives the players a chance to play on the fields they will play their own district tournament on against top notch competition in a big time tournament. Finally, many recruiters and scouts are present making this tournament the showcase event for players looking for recognition to further their careers either in college baseball or possibly getting the opportunity to be drafted. All returning varsity players have played in this tournament the past two years with exception of Jason Savage who has played there all three years. This pressure cooker goes a long way in telling which player(s) will excel at the varsity level. Disclaimer: The above lineup is only a projection and there are a number of younger players from a very highly successful 15 and 16 year old Orangeman team ready to step in if the effort is not there on the part of the varsity starters. All spots are open to be won by the best player when spring practice begins. Front Row: Coach Steve Kertes, Hank Austin, Andrew Marks, Dan Melito, Jason Savage, Vince Campisi , Batboys Vack Milburn, Nick Abbott (Absent). Here are the summer pitching stats with the players shown in the order of their ERA.